Poetry, for August Kleinzahler, belongs to “the realm of fire,” and this fall the critically-acclaimed poet and essayist brings his elemental vision of modern poetics to Claremont McKenna College with two courses on the cultural and historical forces that have shaped the arts, poetry and prose in particular, over the last 150 years. The courses are open to all students of The Claremont Colleges. Hailed by The New York Times as “ a poetry star,” Kleinzahler will teach “The Poet and the City: Speed, Compression, Kablooey” (Lit 099CCm) and “Prose Miniatures” (Lit 099DCM), both rooted in the same deep, penetrating explorations of self that characterize his recent book of essays, Cutty, One Rock: Low Characters and Strange Places, Gently Explained, and his prize-winning poetry selection, Sleeping It Off in Rapid City (recipient of the 2008 National Book Critics Circle Award). 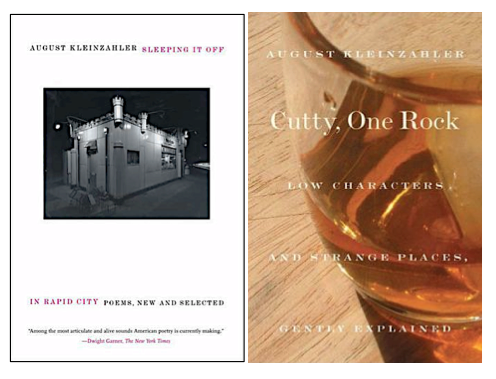 Kleinzahler is also a recipient of a Guggenheim Fellowship, the Griffin Poetry Prize, and the Berlin Prize. Last year, Kleinzahler served as a Visiting Fellow of CMC’s Gould Center for Humanistic Studies. During the 2013 fall semester, Kleinzahler will teach his two courses at CMC as William F. Podlich Distinguished Fellow. Critics praise his work for reflecting “his ability to modulate between high and low diction...and by his wide-ranging fascinations.” That versatility will be on central display in “The Poet and The City” as he traces the transformation of the arts from the mid-19th century to the present day and its collision with pop culture and technology (the “kablooey” of the course’s subtitle). The course will range across a host of figures and movements—including Charles Baudelaire, Walt Whitman, André Breton, Antonin Artaud, William Carlos Williams, Marshall McLuhan, and an “explosion of isms in the early 20th century” — with special attention to the ways in which poetry has been affected by technology and urbanization. Of that effect, Kleinzahler has said that urban life poses continual challenges to poetic technique and convention for every poet, whether established or aspiring. Likening poets’ work to childish temper tantrums may seem highly provocative, but the San Francisco-based poet is no stranger to provocation. If poetry is a fiery realm, then prose has served Kleinzahler as a more temperate vehicle for studying the compendia of modern life as recorded in journalism, diaries, letters, recipes, travelogues, and much more. The course “Prose Miniatures” will examine the style and technique of these varied nonfiction forms, and Kleinzahler will challenge students to expand the range of their own writing skills with exercises in imitation of many of these styles, including reviews, letters, and various descriptive assignments. For Kleinzahler, however, prose has not only been a form for capturing the variety of sometimes small, marginal aspects of daily life, but also for more searing examinations of the self — as he did with Cutty, One Rock, in which he employed the essay form in his efforts to cope with his older brother’s suicide. This course will be a survey of developments in the arts, chiefly poetry, from 1850 to the present. The emphasis will be on how urbanization and technology pressured the arts into new forms (realism, symbolism, cubism, expressionism, futurism, surrealism, documentary, etc.). The course will go back and forth between Paris and New York, starting with Baudelaire and Whitman, the Paris Exposition of 1889, the explosion of –isms in the early 20th century, the impact of train travel, photography x-rays, cinema, mechanized warfare, air travel, radio, television, including the revolution of information technology in the late 20th and early 21st century and how it has impacted traditional modes of reading and writing literature. The texts we will be examining, apart from Baudelaire’s prose poems and Whitman’s poetry, will include Apollinaire, Blaise Cendrars, William Carlos Williams, Andre Breton, Antonin Artaud, Frank O’Hara, and Marshall McLuhan, among others. In almost every instance, the text being discussed will have city life as its subject, or will have been generated by the large fact of urban experience and the related overload and dislocation that experience often entailed. Throughout the course, we will examine the related arts, including: photography, painting, architecture, music, film, both high-brow and popular entertainments. The course will require class participation, an individual or joint class presentation, assorted shorter assignments, and a final paper. letters, diaries, police reports, brief character portraits, travel journals, recipes, monologues, rants, movie reviews, diatribes, daily observation, sports reporting and such that usually lie outside the general purview of “literature” i.e. novels, short stories, plays, full length essays, traditional poetry. We shall examine prose styles over several centuries, with an emphasis on syntax, development and sentence structure. The class will be presented with examples of various forms, from the Elizabethan era to the present and will be asked to both imitate certain styles and fashion new work in the assorted modes, i.e. review a movie, describe the nature around you on the walk to class or the village, write a monologue, comic or otherwise, a love letter, a description of your favorite meal ever, real or imaginary, and so on. The aim of the course is to demonstrate that the art of writing, or artful writing, can be done in less than 500 words and involve subject matter often considered beneath traditional literary art.